Ryan Sherrard joined the IMPRS-LS program in 2013 after completing a Master’s program in Biochemistry at LMU. He is enrolled in the faculty of Biology at the LMU in the lab of Prof Dr Barbara Conradt. Ryan also has the role of an IMPRS-LS student representative and is very much involved in many aspects of the program. Why did you choose to do your PhD with IMPRS? The Max Planck Institute of Biochemistry is world-renowned and offers PhD candidates the opportunity to conduct cutting-edge research. The IMPRS-LS program offers a well-structured curriculum with many benefits, as well as the chance to network across the campus and other institutes. Together, it makes for a prestigious program that attracts talented young scientists from all around the world. Why did you come to Germany and what are the best aspects of studying here at the LMU? If you are considering studying abroad, you will find no better place than Munich! I instantly fell in love with this city while traveling around Europe, and decided to move here shortly after. Munich consistently ranks among the top cities in the world for qualify of life, and there is always something going on—summer in the biergartens, winter in the christmas markets, and plenty of festivals through out the year! In addition, the LMU offers tuition-free education for everyone, so the decision to study in Munich was an easy one for me. How did you adjust to living in Germany and to the change in culture and language? As a Canadian adjusting to life in Germany is not difficult, especially when the IMPRS-LS coordination office are there to help you every step of the way. The research labs here on campus all communicate in english, so there is no language barrier for international students. For those who want to learn or improve their german, the IMPRS-LS program makes language courses accessible for all students. Personally, I was fortunate to serve as an IMPRS-LS Student Representative for three years, which allowed me to work closely with the coordination office and fellow IMPRS-LS students to bring new ideas to the program. I would encourage all prospective student to get involved in any way they can! What encouraged you to become involved in acting as a student representative and do you feel that your role has helped to shape the IMPRS-LS program? I think it is important to be actively involved in your community, and the IMPRS-LS program is no different. I jumped at the opportunity to be a Student Representative, and was fortunate to hold the position for three years. Over that time I met many amazing people, launched new initiatives, and tried to make our outstanding PhD Program even better. The highlights for me were having an active role in the 2015 Program Evaluation, and of course organizing the 2016 IMPRS-LS Graduation Program—an inaugural event that we hope continues to grow over the coming years. What do you feel you have gained from your experience as acting as a student representative? Personally, seeing the inner workings of a successful PhD Program has piqued my interest in scientific management. My three years spent working with the coordination office have essentially been a crash course in program coordination, and in the future I will be open to careers in this field. I applaud the IMPRS-LS coordination team for their hard work and guidance during my time as a Student Representative. What advice would you give to students considering studying here? Studying in Munich is the best decision I've made. I get to conduct novel research while also doing things I love, such as traveling, meeting new people, and getting involved in the community. These are not only my own sentiments, but also what I hear from all students around campus. So if you are considering a move to Munich, you won't regret it—exciting research, great people, and an amazing city. The IMPRS-LS program looks forward to welcoming you! 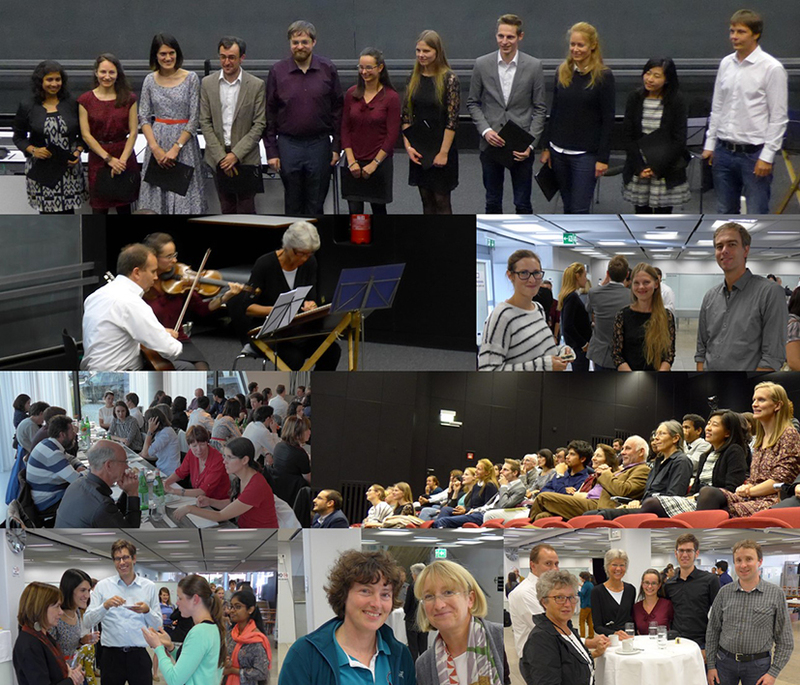 We were delighted to welcome IMPRS-LS students on our annual IMPRS-LS retreat, which this year took place on 25th – 27th September in beautiful Allgäu, in Haus Zauberberg. Deciding to take advantage of the fantastic weather on our arrival, we enjoyed a short hike (with only a small accidental detour) to the nearby ruins of the castles Hohenfreyberg and Eisenberg. On our return, we were greeted with a delicious and traditional Bavarian dinner. Following dinner, students were able to relax and enjoy the facilities Haus Zauberberg had to offer. Our retreat this year was centered on the theme of “Methods and Cutting Edge Technologies”. On Monday, we were very happy to be able to welcome various speakers from the institute and from the LMU who spoke in detail about their area of expertise with a small group of students. Former IMPRS-LS student Arunas Damijonaitis and current IMPRS-LS student Hakan Kucukdereli discussed “Optogenetics and Photopharmacology” in their session. Sebastian Bultmann and Christopher Mulholland from the LMU explored the topic of “CRISPR/Cas”. IMPRS-LS faculty member Franz Herzog and his student Victor Solis discussed “Chemical Crosslinking and Mass Spectrometry in Structural Biology”. Alex Ghanem from the LMU covered the topic of “Viral Tracing”. IMPRS-LS faculty member Jürgen Cox discussed “Computational proteomics” and last but not least, Julia Mahamid and Antje Aufderheide from the MPIB presented their topic on “Cellular Cryo-Electron Tomography and Single-Particle Cryo-EM”. We are very grateful to the speakers for taking time out of their busy schedules to share their insights into their particular topics. After an intense day of discussion about diverse scientific topics, we were pleased to be able to relax and socialize together on Monday evening. Students happily organized various activities, including board games, card games and even an impromptu “night hike”! It was a great opportunity for everyone to get to know each other a lot better, especially for the IMPRS students who have only recently joined the program. On Tuesday we enjoyed a trip to “Schloss Neuschwanstein”, the beautiful castle built by the eccentric King Ludwig II in the latter half of the 19th century. 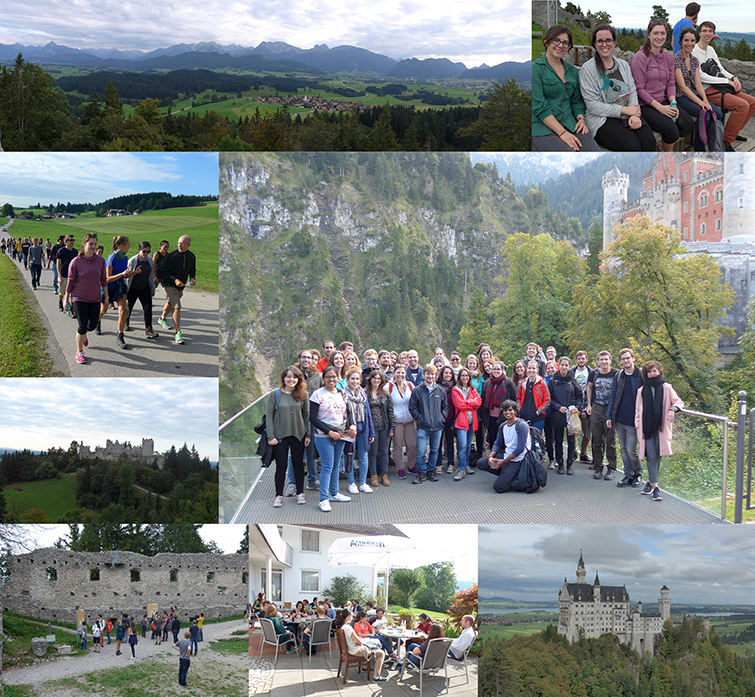 After taking in the stunning views from the nearby “Marienbrücke”, our retreat concluded with a tour through the castle. We arrived back at the institute late on Tuesday afternoon, everyone much more familiar with their colleagues than they were when we left on Sunday. Dr Maria Patra joined the IMPRS-LS program in 2010 after completing a Master’s program in Biochemistry at the TUM. 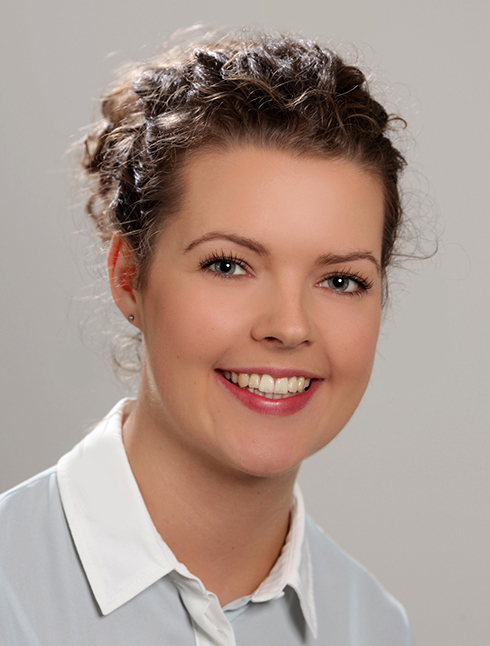 She was working at the Adolf Butenandt Institute of the LMU in the lab of Prof Dr Jörg Tatzelt and Prof Dr Konstanze Winklhofer, where she completed her PhD thesis titled “Effects of Parkin and mutant Huntingtin on the NF-kB signaling pathway” in 2015. 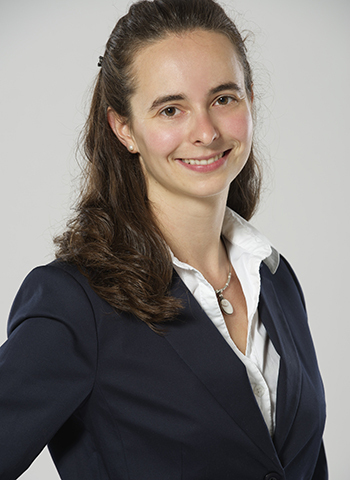 Maria now works as a research scientist for the biotech company MorphoSys, based in Martinsried, Munich. The international aspect of IMPRS sounded very appealing to me, as you gain access to an excellent worldwide scientific network by being a member of this exceptional PhD program. IMPRS not only provides insights into different institutes and scientific fields based in Munich, but also different cultures from all over the world. I greatly enjoyed this colorful bouquet of inspiration possibilities within the last few years - both on a professional as well as on a personal level. Why did you choose Munich and what did you find to be the best aspects of studying at the LMU? During my Master’s program at the Technical University Munich, I already experienced that Munich holds huge potential for fruitful collaborations and exchanging ideas with experts from various research fields. Therefore, I decided to stay here and deepen my research activities in this promising surrounding. As I was interested to do my PhD in Neuroscience and concentrate on neurodegenerative diseases in particular, one group at the LMU offered the most compelling research topic to me. Furthermore, the institute I chose, was also integrated in many other research alliances, which complemented the scientific network provided by IMPRS. After completing your PhD you made the decision to move from academia to industry. Why did you decide to switch and how did the IMPRS-LS help with preparing you for your career in industry? During my PhD, I was able to participate in many helpful workshops funded by IMPRS, which all contributed to my personal development. The workshop which contributed most to my current career focused on career mentoring: We did not only get input from a highly proficient trainer, but also learned from valuable experiences shared by other IMPRS students. As the trainer was already familiar with the participants from previous workshops, the consulting regarding career chances was taking place not only on a professional, but also on a personal level. In general, I consider this to be a very unusual but extremely positive aspect that IMPRS is interested in and takes care of their students’ future opportunities after the PhD. If you want to be part of an excellent academic network, get to know not only talented PhD colleagues, but even find life-long friends, deepen your scientific and personal development during your PhD as well as receive comprehensive support from the IMPRS coordinators whenever difficulties arise, I would highly recommend you to apply for this intriguing PhD program. Samira Parhizkar from Sweden joined the IMPRS-LS program after getting an MSci degree in Neuroscience from the University of Nottingham, UK. 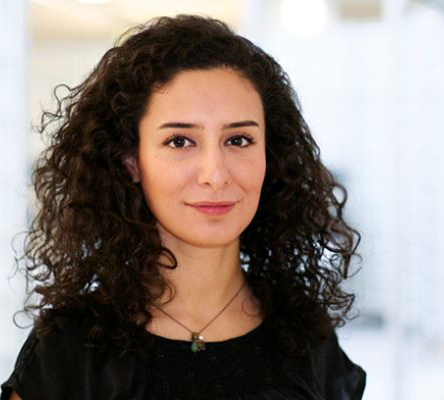 Samira is currently conducting her doctoral studies at the DZNE (German Center for Neurodegenerative Diseases) in the area of neurodegeneration. She recently participated in a science vlog project organized by jobs.ac.uk. Watch Samira's vlogs to find out her top tips for relocating to another country and to take a peek into a PhD student’s life. 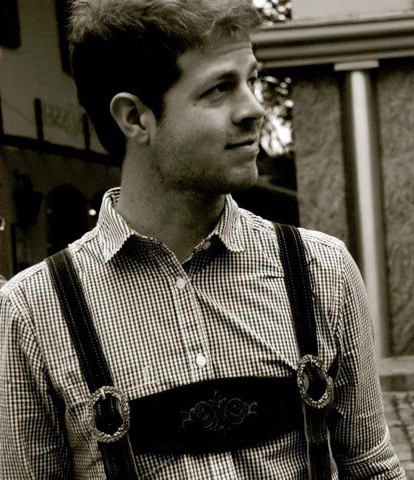 Daniel Hornburg studied molecular biotechnology at the Technical University of Munich and the Georgia Institute of Technology (Atlanta, USA). In 2010, he received the EXIST entrepreneurial fellowship (BMBF) for the development of enzymatic complexes to degrade resilient substrates. 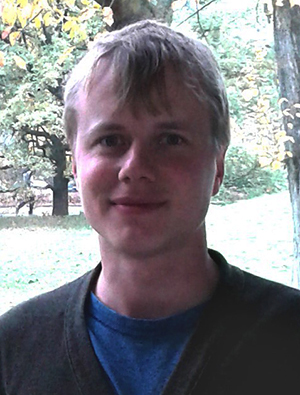 Daniel joined the lab of Matthias Mann for his PhD studies in 2011 where he devised, developed and applied proteomics technologies to investigate neurodegenerative diseases. As postdoctoral fellow, Daniel has joined the group of Systems Immunology at the MPI of Biochemistry in 2015 to work on clinical proteomics. During his stay at the MPI of Biochemistry he has been strongly involved in research associated with the ToPAG (Toxic Protein AGgregation in Neurodegeneration) project. ToPAG is a prestigious six-year interdisciplinary research project funded by the EU and carried out by two Max Planck Institutes. Key to the success of this project is collaborative research and the exchange of ideas and results between several cutting edge labs from different institutes. What do you like about IMPRS? The IMPRS program offers unique opportunities on multiple levels. Firstly, the impressive repertoire of scientific soft skill workshops not only allowed me to acquire new expertise in a broader context but also to specifically develop core competences, for example, in scientific writing and grant application. Secondly, IMPRS provides a great, interdisciplinary scientific network that fueled many collaborative projects we have published in recent years. Thirdly, I am confident I will benefit from an active alumni network in my future career. Why did you choose Munich and what did you enjoy about living in this city? What did you find to be the best aspects of studying at the MPIB? You will find world leading experts in both basic biological research as well as technology development. That combination is very powerful and exciting. You have been very involved in research relating to the prestigious ToPAG research project. How did you become involved and what have you learnt from this experience? How did the IMPRS program help to prepare you for your postdoc? First and foremost, the workshops offered in the IMPRS program were extremely valuable to pursue a scientific career. Moreover, the IMPRS coordination office provided great support and valuable feedback throughout my PhD that helped me to shape and prepare my future career steps. What advice would you give to students considering studying here? Establish and make use of your scientific network. Science is a team effort! On September 22nd, 2016 the school celebrated its first graduation day ever. It was a very exiting day and wonderful to see and honour this year's graduating students, their families and friends. Initiated and largely organized by our student representatives and by many helpers, the day was a great success and everybody had a wonderful time. After the formal graduation ceremony and a reception, graduates, family members and close friends were headed to the campus based restaurant "seven and more" for dinner. Later in the evening, students of the school and invited guests gatherd at the MPI for graduation party to close the day with good music, dancing, interesting drinks and lots of food for those that couldn't make it for dinner. I am already looking forward to next year's graduation day, that is planned to take place in September 2017. Collage of pictures taken during graduation day. Amy Gerc completed her PhD in microbiology at the University of Dundee in Scotland in 2014 and moved to Germany shortly afterwards. She joined the IMPRS-LS coordination office in November 2015 as a trainee in science management and is currently involved in organizing many aspects of the IMPRS-LS PhD program. Why did you decide to come to Germany and how did you adjust to the changes in language and culture? The decision to come to Germany for me was a simple one. My husband (boyfriend at the time) is German and has lived and worked in Munich for more than 10 years. After completing my PhD in Scotland I was in a position where I knew I could start on something completely new and the opportunity to move to Germany seemed too exciting not to embrace. In terms of culture, Munich certainly has it’s own traditions however I wouldn’t say that it is hugely different to our way of life in Scotland (except for the fact that the weather is a million times better!). You can certainly get by in Munich only speaking in English as it’s a very international city, however, since many of my friends and family are German I knew I wanted to learn the language. I have to admit this was not easy! I am now fairly fluent and I believe my learning the language has really enriched my experiences here. Why did you decide to apply to IMPRS-LS for the position as a trainee in science management? Throughout my PhD I was involved in the organization of a number of events, particularly public outreach events, and I knew that the planning, development and organization of these activities was something that I really enjoyed. Whilst I knew I wanted to stay in science, I was keen to explore options away from the bench. The Max Planck Society has an excellent reputation in Germany and I believed that working as a trainee in in the IMPRS-LS coordination office would be a great way into the world of science management. How did it feel to switch sides from being a PhD student to becoming a manager of a PhD program? For me, this felt like a natural progression. Working in science management, I am of course no longer working in the lab and whilst I do miss some aspects of lab work, I am very much enjoying the change and the opportunity to learn so much in a different field. Can you briefly describe your job in more detail? The IMPRS-LS coordination office is responsible for the organization of almost all aspects of the IMPRS-LS PhD program, including overseeing the entire application process. Since I started working in the office, I have gradually become more involved in different projects. At the moment I am involved in the organization of the IMPRS training workshops, the biannual IMPRS seminar, the annual IMPRS retreat, the IMPRS lecture series, the IMPRS newsletter and various other activities that IMPRS is involved in organizing throughout the year. I am also involved in the selection process for new IMPRS-LS candidates. On a day-to-day basis my job is quite variable. At the moment we have been working a lot on the design and content for a new website and are preparing for the arrival and integration of our new IMPRS-LS students. What have you learnt during your time at IMPRS-LS and do you think you can make a difference in this environment? A lot! I am a generally organised person, however I have to admit working in a coordination office in Germany has been an eye-opener. I have learnt a lot about the amount of work that goes into successfully running a PhD program, how attention to detail is very important and how important it is to constantly be thinking about the next steps to ensure the IMPRS-LS maintains it’s position as a top class program. In the coordination office we are always very open to new ideas from students and of course also from colleagues. I definitely feel like I have the opportunity to make a difference. I really love how I am able to be involved in lots of diverse projects. 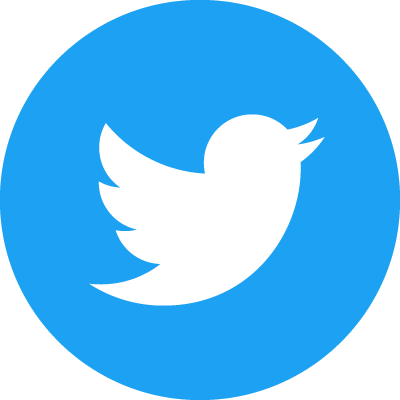 I am also in the lucky position that I am able to keep up to date with the amazing science that’s taking place in the institute whilst also having a chance to influence the general organization of so many different aspects of the program. It’s great to see how our hard work in the office translates into making a difference for our students and faculty. How does completing a PhD in Germany compare with your own experiences in Scotland? I would say that overall the process is fairly similar. As I was not part of a structured program in Scotland, it was more difficult to participate in the excellent soft skills workshops that our students have access to. Otherwise, I also presented my research at national and international meetings, was required to present my work at “Thesis Committee Meetings” and of course wrote my thesis and had my viva at the end of 4 years of research. I believe that one of the great things about science is how international it is, I can easily relate to the IMPRS-LS students' experiences. What advice could you give to someone who is interested in pursuing a career in science outside of academia? Get involved as much as possible! I think it’s really important to show initiative and drive by really being active in your participation in a variety of different projects throughout your PhD. It’s easy to get a bit too involved in your research and to forget sometimes that there is a world outside of your research field. Taking a step back and participating in something a bit different now and again can also really help with keeping your PhD research fresh and exciting. Sally Deeb from Lebanon joined the IMPRS-LS after getting a Bachelor’s degree in science at the Lebanese University and a Master’s degree in biology at the American University of Beirut. She was conducting her doctoral studies in the area of proteomics at the MPI of Biochemistry, where she completed her thesis titeled "MS-based Quantitative Proteomics for Molecular Cancer Diagnostics" in 2014. Why did you decide to come to Germany for a PhD? For me who wanted to pursue a science-related career, Germany was one of the best options to do my PhD. The country is well-known in many fields of research, and in particular, it is famous for its leading technologies and internationally competitive labs in biology, biotechnology and biochemistry. Also, the pharmaceutical industry in Germany plays an important role. So there were some good reasons for me to come here after I completed my Master’s degree in Lebanon. In 2009, you started your PhD at the IMPRS-LS in Munich. Why did you choose an International Max Planck Research School? In my last year at the American University of Beirut, I heard about the IMPRS from a colleague who was already in Munich and recommended the doctoral program. First, it was important for me to choose an English-speaking PhD program. What makes it very attractive is that after the first round of selection it offers an interview week which allows applicants to visit the labs and have a closer look at the research going on. The IMPRS-LS is specialised in life sciences and was exactly the doctoral programme i was looking for. I did my research in a proteomics lab, where I apply the latest mass spectrometry technology to try to characterise different tumour subtypes with the aim of improving patient diagnosis and treatment choice. What makes the program so attractive for you? The IMPRS-LS gives you the opportunity to join a network of elite research groups. The interdisciplinary curriculum allows you to establish contacts with researchers from different labs, technologies and areas of science and gives you the chance to exchange expertise and knowledge with them. My program included 100 to 120 international young researchers in all fields of life sciences. Can you describe the main components and the supervision within the programme? The program is based on a credit system. In our first and second year we have to attend a specific number of lectures, seminars and workshops. But then everything else is flexible throughout your PhD. Every student is primarily affiliated to his or her lab and specific supervisor with whom one regularly meets. In addition, there is an individual Thesis Advisory Committee to which the doctoral student has to report each year. Its purpose is to monitor the progress of your work and to advise you regarding the development of the research project. You were also involved in the so-called Soft Skills Workshop Series? Yes, that is something very nice. We have access to high-level workshops. For me, the soft skills workshops were the most interesting. They deal for example with team-building and leadership skills, intercultural communication, project management, scientific writing and career development. These workshops help a lot in expanding your skills for your future career, whether it is in academia or industry and I was involved in organising these workshops. Could you imagine staying in Germany after completing your PhD thesis? I would like to work in the pharmaceutical industry, but I’m not limited to Germany. Currently I’m working in the Department of Proteomics and Signal Transduction. My supervisor is a pioneer in the field of mass spectrometry and its applications in answering different biological questions. It would be great to get a job where it’s possible to continue what I have learned. That means to answer questions related to cancer and other diseases. What would you recommend young researchers planning to come to Germany? Join a structured PhD program at an IMPRS. It improves your credibility and immediately places you in a network of excellent research groups. It connects you to young researchers from all around the world and allows you to make good friends. It’s like having a first-class ticket to cutting-edge research. 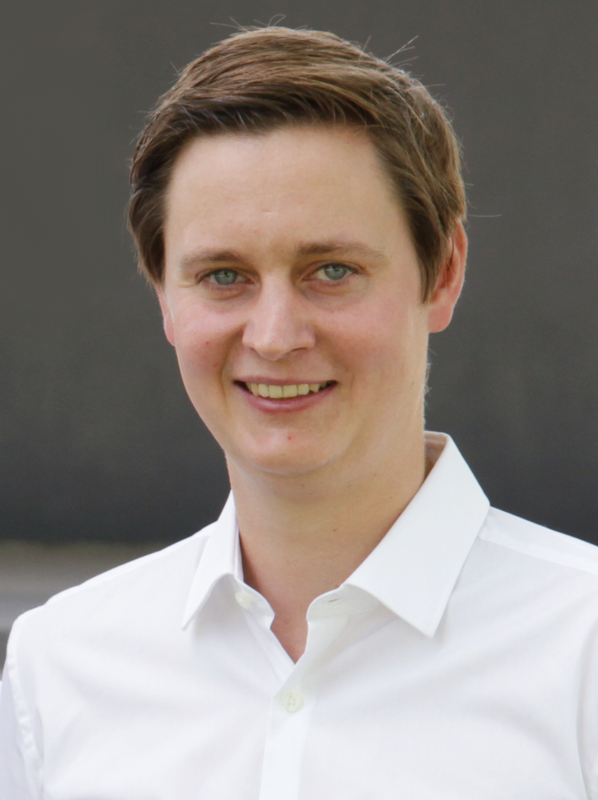 Dr. Garwin Pichler (34) studied biochemistry at the LMU Munich and completed his thesis titled “Crosstalk between histone modifications and DNA methylation” in 2008. Garwin was enrolled as an IMPRS student at the faculty of biology at the LMU Munich. He has many years of experience in the development of high-throughput platforms for the mass spectrometry-based proteomic analyses of clinically-relevant samples such as blood plasma and urine. Whilst conducting his research, Garwin studied "Business and Management" in parallel to gain knowledge of strategic and operational processes in companies. Prior to founding his own company, Garwin worked as consultant for the spin-off ChromoTek GmbH to prepare the market entry of products for academic research. I had been working at the MPI of Biochemistry for my Master Thesis and decided to do my PhD thesis in the faculty of biology at the LMU Munich. I decided to apply for the IMPRS program to allow me to be able to use the advantages of all associated institutes. As an IMPRS student, I was able to collaborate with a group at the MPI of Biochemistry as well as with a group at the faculty of biochemistry at the LMU Munich in a interdisciplinary manner. Why did you choose Munich and what are the best aspects of studying here? That’s simple ;-) It is a combination of the best research structure in Europe, the high living standards of Munich as well as the fact that I have been living and enjoying life in Munich now for over 30 years. How did the IMPRS program help with preparing you for life after your PhD? 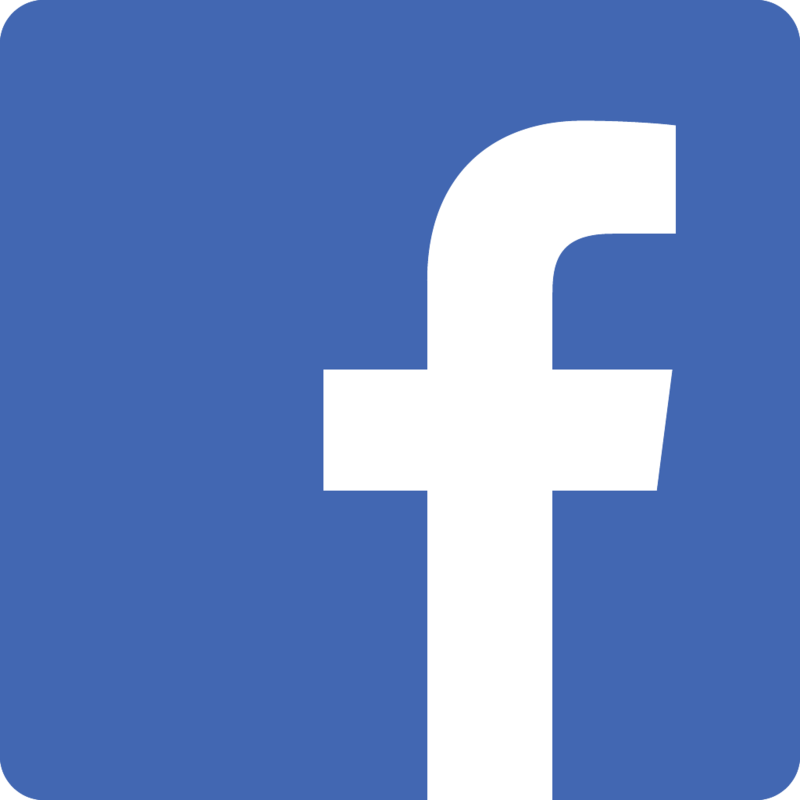 How did you come to the decision of founding your own company? I was working closely together with a spin-off during my PhD and I gained insights into the exciting issues and everyday challenges of establishing your own company. From then on, I was fascinated with starting my own company and participated in workshops such as the “Innovationsakademie Biotechnologie” and I also studied economics in parallel to completing my Postdoc at the MPI of Biochemistry.